Two Airmen Killed Near Picton, Ont. 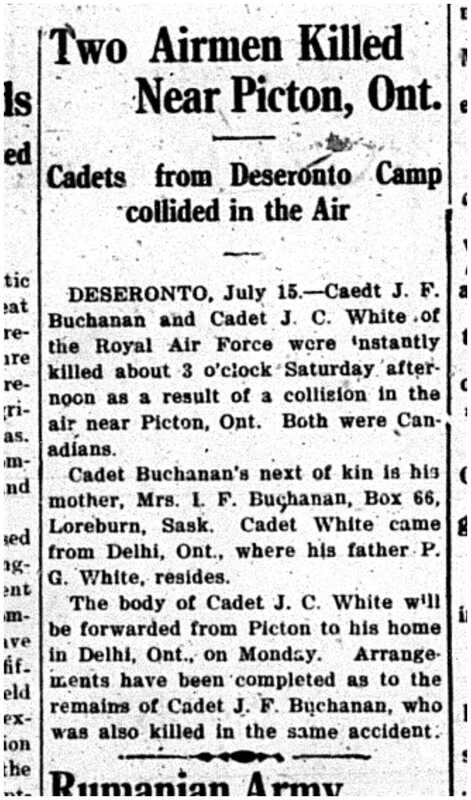 DESERONTO, July 15- Caedt J. F. Buchanan and Cadet J. C. White of the Royal Air Force were instantly killed about 3 o’clock Saturday afternoon as a result of a collision in the air near Picton, Ont. Both were Canadians. Cadet Buchanan’s next of kin is his mother, Mrs I. F. Buchanan, Box 66, Loreburn, Sask. Cadet White came from Delhi, Ont., where his father P. G. White, resides. The body of Cadet J. C. White will be forwarded from Picton to his home in Delhi, Ont., on Monday. Arrangements have been completed as to the remains of Cadet J. F. Buchanan, who was also killed in the same accident. On July 13th, 1918 two cadets from the Royal Air Force’s 81 Canadian Training Squadron at Camp Rathbun in Deseronto were killed when they collided in mid-air near Picton. Herewith Court of Inquiry in which Cadets Buchanan and White were killed. I visited the scene of the accident shortly after it occurred and while there was asked by a Mrs. Palmer that Cadet White’s body be taken to her house. She stated that Cadet White was a great friend of the family and had always spent his leave with her. She also stated that Cadet White had on the previous day visited her home and had promised to come over the following day and drop a message to her. When this Court of Inqiry first came in I returned it to the President with instructions for him to get evidence from Mrs. Palmer. The Court went over to Mrs Palmer’s house at Picton for the purpose of getting her evidence but she she refused to give any evidence at all. 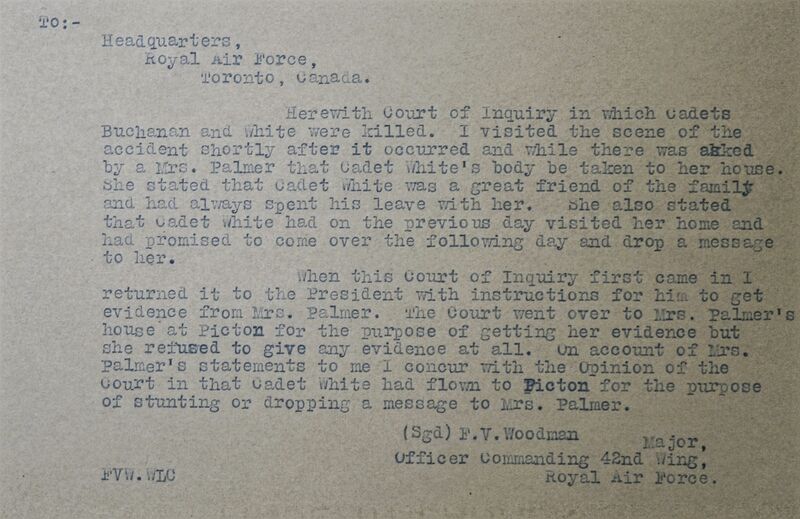 On account of Mrs. Palmer’s statements to me I concur with the Opinion of the Court in that Cadet White had flown to Picton for the purpose of stunting or dropping a message to Mrs. Palmer. This could have been Annie Palmer (née Ready), who was listed as living near Picton in the 1921 census. She married Leonard Palmer in 1912 and would have been 27 at the time of the crash. The centre man turned to the Right fairly sharply, the Right hand man turned to the Left and the wings of the machines caught. The two machines came down locked together. I went to the field where they fell and one pilot had just been taken out of his machine, – he was alive at the time. The other fell out of his machine as they collided and fell about 100 feet from the crash. Irwin’s family were living in Detroit and he was buried in that city, in Mount Olivet Cemetery. The other pilot was 23-year-old Gilbert James White. He had joined the Royal Flying Corps in Toronto on December 12th, 1917 with the regimental number 153535. He was five feet eleven inches tall and had previously been working as a clerk in London, Ontario. He was born in Delhi, Ontario on August 16th, 1894, the son of Philo Gilbert White and Edith (née Wilson). Gilbert was buried in Delhi Cemetery, Ontario.